We all know about Jahnvi Kapoor and Ishaan Khattar’s upcoming movie ‘Dhadak’ and its time we accept the fact that they are the perfect couple. If you have any apprehensions about believing so, here they now feature in the Harper’s Bazaar cover. Looking stunning, feeling like royalty, this cover will sure take your breath away. Janhvi and Ishaan featuring on the cover of a leading fashion magazine is ofcourse part of their promotional plans but the chemistry doesn’t look made up. The Dhadak couple pulls of the red wine and white combo so beautifully, these two are a vision to look at. 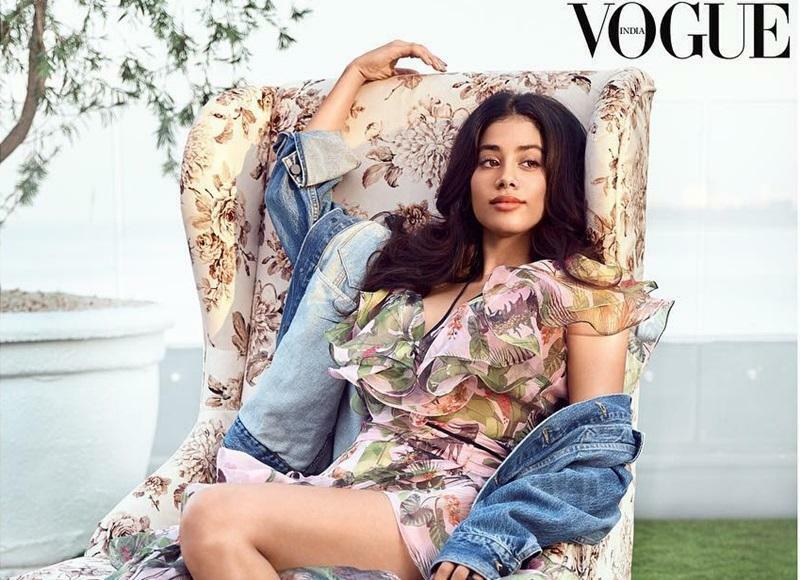 This is not the first photoshoot for Janhvi but she has made her debut in magazines on a Vogue cover but that was rather a tad bit boring to be honest. It was not fault of hers because that shoot was done just after the demise of Late Sridevi, her mother and it is very much understandable but look at this cover now. When you are the hardest critic of yourself, it becomes easy to get close to perfection! Janhvi has upped her professionalism game on and sharing space with her co-star and friend, Ishaan Khattar, these two look at their best. Styled by Edward Lalrempuia, Janhvi is dressed in a beautiful rose-hued skirt from Calvin Klein along with a plain white tank top. Her make-up artist for the look is Sandhya Shekar, who gave the actress the red bold lips which uplifts the entire look upto royalty. Ishaan, on the other hand, looks candid but the suave can’t be missed. He coordinated with Janhvi’s look in a checked brown and blue suit from Calvin Klein. Now, do you still think, they are not the perfect casting for the movie?